Product #60792 | SKU GO XLR | 0.0 (no ratings yet) Thanks for your rating! 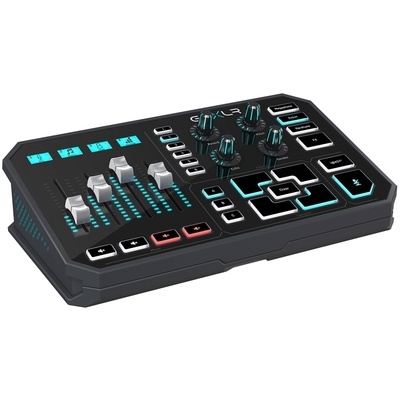 The front panel features four motorised faders, four customisable scribble scripts, four channel mute buttons, and dedicated vocal effect buttons for Megaphone, Robot, Hardtune, as well as six voice FX preset buttons for storing your own custom vocal FX. Additionally, there are four parameter knobs for the real-time adjustment of FX from the desktop. Also, included are three banks of four sample pads designed for sound effects, stingers, bumpers, and more. You can utilise the GO XLR app to load samples, or record and/or clear them direct from the unit for on the fly operation. There is also a dedicated ! @#$* button for bleeping expletives and a Cough button for momentary muting of your microphone.